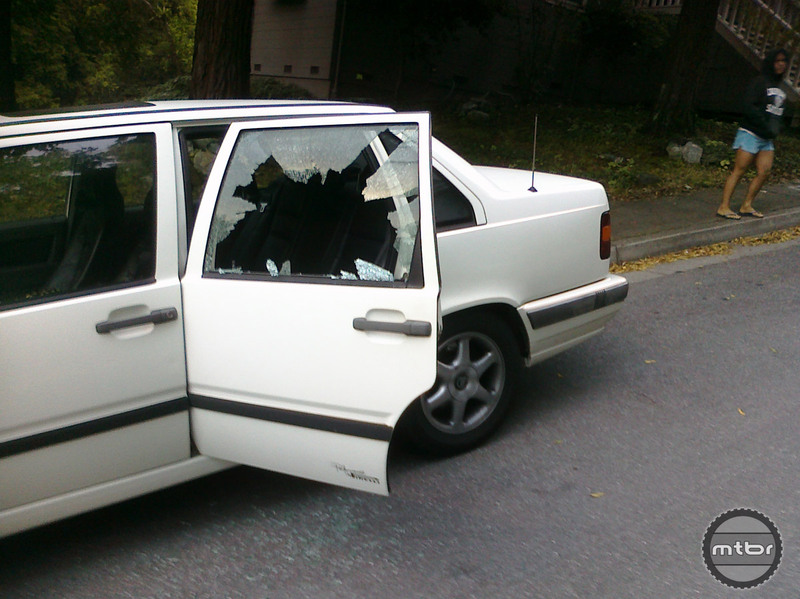 Thieves smashed the window of this Volvo in order to steal the authors bike. Santa Cruz is world famous for its incredible trails, but it has also developed a rep for its high theft rate. In the first five months of this year alone, 155 bikes were reported stolen. Imagine how many went unreported? Many times these bikes are gone forever, but some owners have had success tracking down high-end custom bikes by sharing information online. And it’s not just riders that are using the internet to track down stolen bikes, the local police are turning to technology to help reunite old friends. Just a few weeks ago they posted a picture of a stolen Evil on Instagram and a friend of the owner recognized the bike. Had a different set of circumstances played out, the owner may have never seen his rig again. The Santa Cruz Police recover dozens of stolen bikes each year, but since few are reported stolen by owners or registered, many end up being donated to local nonprofit organizations or auctioned off. For years the police have had a bike registration program but it required a visit to a participating bike shop or police headquarters. To help motivate more people to register their bikes, SCPD has just launched a free method for registering your bike online. Once your information is entered, the police mail out a sticker with an ID number that is applied to your bike. This license never expires and in the event that your whip is ever stolen, the unique ID (which is tied to your serial number and other relevant information) will expedite the return process. Local police departments are responsible for their own databases, but the CA DMV keeps track of which police agency has the information pertaining to a specific license. The best part about this registration sticker is that information is available to all police agencies in California. There is technically no statewide database, but the DMV tracks which police department has been assigned each number. So if a stolen bike is recovered in another part of the state, the police can contact the local department the license is registered to and track down the rightful owner. Cyclelicious has a great article on how this works available here. Have you registered your bike with the local police department? Have you had your bike stolen and then returned with the aid of a bike registration? Please share your stories in the comments section below. To learn more, visit SCPD. What Santa Cruz PD is doing is great…but…. As the article states, there is no statewide database or bike registry run by the State of California. 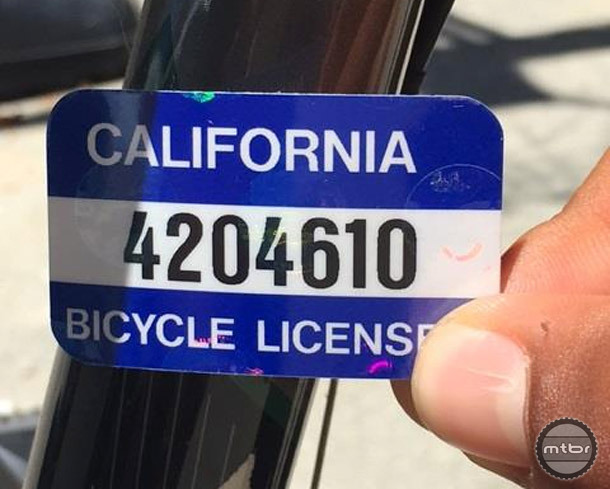 DMV does issue “Bicycle License” stickers and keeps track of which law enforcement agency has been assigned which numbers when they order a bunch of the stickers. Problem is, most law enforcement agencies in California do not have a local licensing program that utilize these stickers. No time, money, or personnel to keep up with issuance and recordkeeping. So most don’t order them. Also, some may have a program one day and the next it is gone due to budget cuts or inactivity (a department I worked for had very little interest from the citizens of the municipality as far as bike licensing). I remember an instance where I was dealing with a recovered bike that had a license sticker, got the info from a CLETS check with dispatch on what department “owned” the sticker number, contacted them and was told they no longer had a program of local licensing and they no longer had the records…someone decided that after about 8 years of inactivity there was no reason to keep the index cards the owner info was stored on. The stickers can also be removed…takes a bit, but they do come off and many dirtbags who steal bikes remove or make illegible the stickers…they just scratch as much of them off as they can. Most cops, when dealing with a potential stolen bike, will have their dispatcher run any serial number found through the law enforcement data system, not any of those consumer online registry services or any other registration scheme. Most states have their own database/computer system (i.e. in California – C.L.E.T.S = California Law Enforcement Telecommunications System) which will store the bicycle make, model, and serial number if that info is given to an officer when they take/write a crime report for the theft of that bicycle. If you report your bike stolen but do not have the identification info then you are S.O.L. – there is nothing to enter into the law enforcement data system that will get your bike back to you: they cannot enter partial info, such as “a black Specialized mountain bike”….you know how many of those get reported? They cannot enter a record without a serial number and make/brand. Some states even push their data records into the national crime data index (NCIC) so if your bike is stolen and you report the serial number and it is recovered out of state you still may have a chance to get it back. One of the best things to do is take a photographic record of the bike, with good lighting and clear shots, that show the whole bike from both sides, the front (showing brand headbadge), a close-up shot of the serial number (bottom bracket is usual location, sometimes on tubes or rear dropouts), and shots of any particular parts/components/accessories you may have upgraded that are different than stock. Keep printed copies of these photos along with a complete identifying description (including Serial Number!) and replacement costs (bike and upgrades/accessories) that you can hand over to a law enforcement officer when they come to take a report of your stolen bike. Update your photos/id info when you make changes to your bike. Another thing to think about that helps law enforcement get your bike back to you is adding YOUR identifier to the bike frame. Take an engraver and engrave your driver license number somewhere on the bike frame. Since that number is something your local law enforcement officers are constantly running through their computer system it will stand out like flaming letters to them. It will quickly and easily give them access to your name and address, being one of the best methods of getting your bike back to you even if you do not file a stolen report to get the serial number into the crime database. Another thing to think about is putting your contact info in to the frame, via the seat tube or bottom bracket. When I was managing the property/evidence unit for a suburban California police department I would habitually look for any type of identifying info on the bikes we would get in as recovered or found/abandoned. I would remove the seat/seatpost to see if anything was in that tube, and since I was a bike mechanic I would also remove the cranks/bottom bracket. I got bikes back to some people because they left slips of paper inside the frame with their contact info on it (and charged some bad guys with theft or possession of stolen property…depending on how the bike came into the department’s possession) or due to a bike shop putting their business card in the frame. Some bike shops would put their card in the bottom bracket or seat tube back in the day…I have called up shops who found customer info in their records with which I used to get the bike back to the owner. This is genius. I’m going to advocate for it here in Portland! However, I’ll take it a step further and try and have the bikes SN# correspond to the registration number. So if the registration gets peeled off, the bikes SN# will still be on file under the registration so Police can use either of the numbers to track down the owner in minutes.